Last time I wrote about Python For Loops and If Statements. Today we will talk about how to combine them. In this article, I’ll show you – through a few practical examples – how to combine a for loop with another for loop and/or with an if statement! Note 2: On mobile the line breaks of the code snippets might look tricky. But if you copy-paste them into your Jupyter Notebook, you will see the actual line breaks much clearer! The more complicated the data project you are working on, the higher the chance that you will bump into a situation where you have to use a nested for loop. This means that you will run an iteration, then another iteration inside that iteration. "The title [movie_title] is [X] characters long." Note: remember len() is a Python function that results in an integer. To put this integer into a “printable” sentence, we have to turn it into a string first. I wrote about this in the previous Python For Loops tutorial. I know, Python for loops can be difficult to understand for the first time… Nested for loops are even more difficult. If you have trouble understanding what exactly is happening above, get a pen and a paper and try to simulate the whole script as if you were the computer — go through your loop step by step and write down the results. Inside a for loop, you can use if statements as well. Let me use one of the most well-known examples of the exercises that you might be given as the opening question in a junior data scientist job interview. Go through all the numbers up until 99. 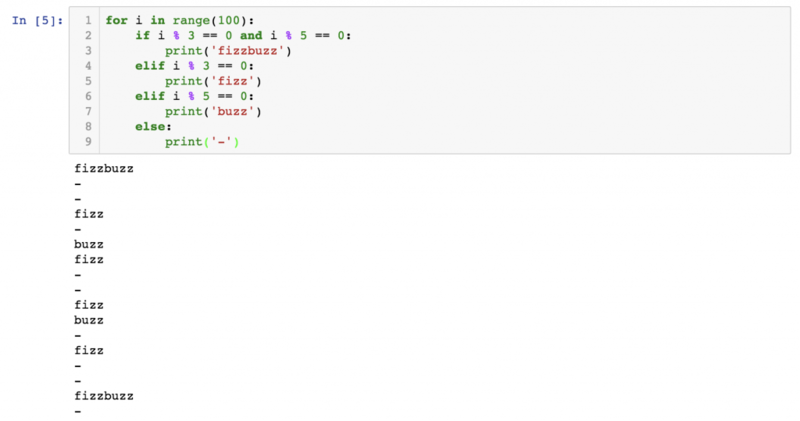 Print ‘fizz’ for every number that’s divisible by 3, print ‘buzz’ for every number divisible by 5, and print ‘fizzbuzz’ for every number divisible by 3 and by 5! If the number is not divisible either by 3 or 5, print a dash (‘-‘)! As you can see, an if statement within a for loop is perfect to evaluate a list of numbers in a range (or elements in a list) and put them into different buckets, tag them, or apply functions on them – or just simply print them. Again: when you use an if statement within a for loop, be extremely careful with the indentations because if you misplace them, you can get errors or fake results! There is a special control flow tool in Python that comes in handy pretty often when using if statements within for loops. And this is the break statement. print(i) –» The number is printed to the screen. break breaks out of the for loop, so we can make sure that the first 7-digit number was also the last 7-digit number that was printed on the screen. Learn more about the break statement (and its twin brother: the continue statement) in the original Python3 documentation: here. Note: you can solve this task more elegantly with a while loop. However, I haven’t written a while loop tutorial yet, which is why I went with the for loop + break solution! It’s time to test whether you have managed to master the if statement, the for loops and the combination of these two! Let’s try to solve this small test assignment! Based on your answer the computer can come up with another guess until it finds out your exact age. Note: to solve this task, you will have to learn a new function, too. That’s the input() function! More info: here. Ready? 3. 2. 1. Go! Note 1: One can solve the task with a while loop, too. Again: since I haven’t written about while loops yet, I’ll show you the for loop solution. Note 2: If you have an alternative solution, please do not hesitate to share it with me and the other readers in the comment section below! STEP 1) I set a range between 0 and 100 and I assume that the age of the “player” will be between these two values. If the guessed age is correct, then the script ends and it returns some answer. Did you find a better solution? Share it with me in the comment section below! for loops and if statements combined. They are not necessarily considered to be Python basics; this is more like a transition to the intermediate level. Using them requires a solid understanding of Python3’s logic – and a lot of practicing, too. There are only two episodes left from the Python for Data Science Basics tutorial series! Keep it going and continue with the Python syntax essentials!